Our courses take place at Ravenshill Woodland Reserve, Alfrick, Worcestershire, which is a 50 acre privately owned nature reserve, which Phil has been coppicing since 1999 and has a patchwork of diverse habitat including many indicator species of ancient semi-natural woodland. It has both deciduous and various conifer species. 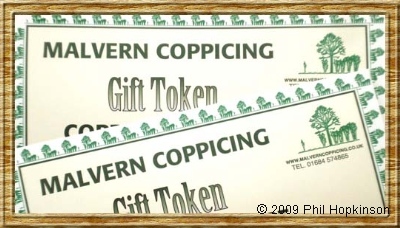 Our gift vouchers are an ideal present for christmas, a birthday, anniversary or other special occasion and a way to give your friend or loved one the chance to spend a magical weekend in a wonderful Worcestershire woodland and learn more about the traditional craft of coppicing. 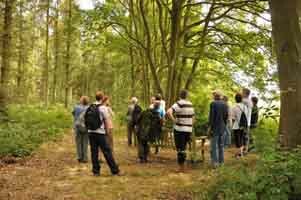 I offer tuition in coppicing and traditional woodland managment for small groups or individuals. This can be from one day or up to three days. A hot meal and drinks are provided in my covered camp kitchen. Please contact me for prices and availabliity. A 10% reduction is available to Ravenshill Woodland Reserve, Worcester Wildlife Trust and Malvern Hills Conservators registered volunteers. My courses take place at Ravenshill Woodland Reserve, Alfrick, Worcestershire, which is a 50 acre privately owned nature reserve, which has a patchwork of diverse habitat including many indicator species of ancient semi-natural woodland. It has both deciduous and various conifer species. Camping is available in the wood for course participants on two day courses at a cost of £6 per night per person. There are also some excellent hotels and B&B'S locally. Please go the links page for local accommodation. Click here to go to a googlemap of Ravenshill. Superb course, very informative and enjoyable. I know know my Spindle from my Dogwood and can spot a Field Maple at 20 paces. Your tips regarding Bristol Design, etc were also very much appreciated (as was the food). Informative, friendly and much enjoyed. Thank you Phil. 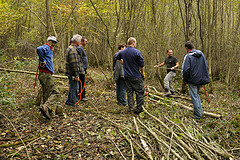 Good value, covered all aspects of coppicing, friendly relaxed atmosphere. Thanks for the very useful points for tool suppliers, etc. Very useful, very informative, and a very nice atmoshere- Thanks very much.